AS Sri Ramanasramam was taking shape followers of Bhagavan also increased. They also began taking part in the Ashram activities. With the increase in the number of followers and Ashram inmates it became necessary to regulate the running of the Ashram. As Bhagavan aged his body became easily tired hence it became necessary to regulate the visiting hours. Of course, these regulations were not to the liking of some but, the Ashram could not, obviously, be run without any regulations. but as he was suffering from rheumatic pains, that posture caused him pain. He felt that the regulations applied to him also. To get Bhagavan to resume his normal posture, the attendant allowed the western lady to sit in any posture convenient to her. Gradually, the number of animals devoted to Bhagavan decreased with the increase in the number of human devotees. Here is a little about the animals. The darling of all ashramites, Lakshmi the cow was believed to be Keerai-patti reborn. She had a free run of the Ashram ground. She would often trample upon vegetable beds and have her fill and if anyone tried to chase her away, the Maharshi would intervene and say, "It was your fault that you did not properly fence off the area. Why blame her?" On such occasions, Lakshmi would walk into the hall and stand close to Bhagavan as if she was innocent. Nobody could do anything about it. Lakshmi was quite intelligent and she was aware of the timings for food and without feeding her first no one else even thought of a meal. During summer, cool water would be specially kept for her. Lakshmi was very fond of fruits and would savour them as the Maharshi fed her with fruits. In turn, she would lick Bhagavan's body with her rough tongue and make it appear red, Bhagavan's patience was truly remarkable. Lakshmi was naughty also and did not hesitate to use the hall as a toilet or to make threatening advances towards new comers. Of course, if they patted or caressed her she would be nice to them. On festive occasions special care would be given to Lakshmi. She would be bathed and suitably done-up. She would also be decorated with garlands. As if to show her beauty she would immediately run to Bhagavan and stand before him. She would not return to the cowshed without visiting the Maharshi in the evening. Before her departure the Maharshi would feed her bananas. On some occasions, Lakshmi would stand tear-filled in front of the Maharshi as if some experience of an earlier birth came to her mind. Maharshi would console her on such occasions and thereafter she would slowly move towards the cowshed. of Maharshi or on the day of his Janma-Nakshatra (Punarvasu). Her progeny grew up in the Ashram. Lakshmi was very conscious of her importance-she would not touch ordinary bananas if the mountain variety was available. On the occasion of the inauguration of the cowshed, Lakshmi came a little earlier than the prescribed time and stood before the Maharshi refusing to budge until he rose. The Maharshi rose saying, "She wants to take me to her new house why do you want to send her away?" Lakshmi showed him the way to the cowshed as the ashramites watched astonished. This deer was presented to the Ashram by a manufacturer of match boxes. The deer also was loved by the ashramites. All visitors used to pet her , with the result that she became completely accustomed to human company. She roamed about so freely that she would mix with the lambs of outsiders and accompany them for grazing. On several occasions the shepherds would bring back the deer to the Ashram. Once, she strayed far away when some poachers hurt her . On noticing that the deer belonged to the Ashram, someone went to her rescue and brought her back to the Ashram. In spite of all the attention bestowed on her, the deer lost her life. The deer was buried on the northern side of the Ashram. The manner of Jack's death is interesting. About three weeks prior to the Pongal festival of 1933, Jack fell ill. Even earlier, he refused to take any solid food because of which he was fed on milk. Ever since he became sick, Jack did not leave the presence of Bhagavan. The repulsive smell which is characteristic of a dying dog never emanated from him. Though his death was expected any time, he survived till the festival was over and passed away peacefully. The parallel between Jack's death and that of Bhishma the grand warrior of the Mahabharata was not missed even by Bhagavan who said as much. With the death of Jack, Kamala's progeny came to an end. For some time the activities of the squirrels in the Ashram were intense. The squirrels would take liberties with Bhagavan like crawling over him. In turn, Bhagavan would feed them with various nuts. One day, a squirrel bit Bhagavan's finger as he had not fed her by then. In September 1945, a visitor placed two pigeons on Bhagavan's lap and would not take them back. Bhagavan caressed them affectionately at which both the pigeons closed their eyes and became still as if in samadhi. During the same period another visitor brought two leopard cubs and gave them to Bhagavan. As usual, Bhagavan caressed them and fed them milk. Both the cubs fell into a deep slumber near Bhagavan's sofa. A devotee took a photograph of this. Similarly, the white peacock sent by the Maharani of Baroda, became a picturesque addition to the Ashram. philosophy in his Maha Yoga. Those who translated Bhagavan's works into other languages and those who spread Bhagavan's glory all over the world were also there. There is an old saying, "It does not matter even if you are not learned. If you are sincere and devoted in your sadhana [?] the results will follow on their own." Sri Rama Yogi's life is an example of this saying. He came from a village, Mopuru, near Nellore. His family was well known for its philanthropic disposition and thirst for knowledge. A peculiar feature of the family was that in each generation only one male child was born and within a short time of its birth the father passed away. The same thing happened in this case also because of which Ramaiah was brought up by his maternal uncle at a neighbouring village. advised him to perform his japa in a lonely spot in the garden of their house and thus dissuaded him from undertaking the proposed trip. In addition to japa Ramaiah resorted to vegetarian food and Pranayama, this last, without anyone's guidance . In a short time he had various spiritual experiences but they soon passed away. Once, he had a unique experience where everything appeared as a brilliant light. Ramaiah wondered what it was and tried to find out its nature from various people but to no avail. His guru also had passed away by then. Remembering the name Arunachala, which he had came across earlier, Ramaiah went there to get his doubt cleared from the Maharshi. Bhagavan explained the phenomenon as a consequence of samadhi, to the satisfaction of Ramaiah. Thereupon he took Bhagavan to be his guru and decided to stay at Arunachala. For a long time he stayed at the mango-tree cave performing tapas [?]. 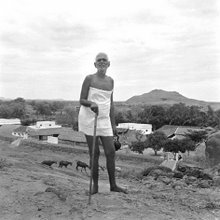 Later, he built an ashram at the village where his mother lived and divided his time between the village and Arunachala. Owing to his goodwill and love towards all beings, even towards poisonous animals like serpents he was never harmed by any creature. He had several occult powers. One among those who experienced them was Paul Brunton, who said that because of Yogi Ramaiah he experienced a stillness of mind. Ramaiah's disciples celebrate his Jayanti year after year. Salem. As a lawyer and a freedom fighter he became quite famous and in spite of being made fun of, spoke in his mother tongue (Tamil) in the Madras Legislative Assembly. His domestic life took an unexpected turn with the accidental death of both his sons on the same day. With that shock he turned towards spiritual life and came to Arunachala in 1928. He stayed at the Ashram for about three years. He took great pains in collecting details of Bhagavan's life; he obtained written statements from various persons, and brought out a biography of Bhagavan (Self-Realisation). He mastered western psychology as well as spiritual literature in Sanskrit. He was a very great devotee of Bhagavan but took care not to exaggerate anything about him in the biography and succeeded in turning many persons towards Bhagavan. He had great interest in reconciling eastern and western spiritual thought and he believed that even in deep sleep the mind was very much in existence. In support of this belief he cited the facts that but for the presence of the mind there could be no recollection of happiness during sleep or the capacity to wake up at a pre-determined time. He held that thoughts of the waking state weakened and resulted in absent- mindedness, day dreams, dreams and deep sleep. Bhagavan would try to convince him that in the deep sleep state the mind would only be in abeyance (laya [?]) but would not be destroyed (nasa) and that because the mind was so weak it could be taken to be practically non-existent. Author of Bhagavan's biography in Tamil, he became famous as a journalist and author even quite early in life. His Tamil work Bharata Sakti is quite well known. He developed a great liking for national education and in collaboration with VVS Ayyar established a Gurukula at Cheranmahadevi. He had an interest in naturopathy as well. In order to know the essence of all religions he studied all religious texts extensively. As the implementation of his lofty ideals needed sakti, he began worshipping Sakti (Sakti -upasana); towards this end he learned pranayama [?] and had certain spiritual experiences. While at the famous sacred Jain spot, Sravanabelagola studying Jain scriptures, Suddhananda had a desire to have Bhagavan's darshan. When he reached the Ashram, Bhagavan's physical body could not be seen by him but only a column of light and later a Siva Linga. Subsequently, Bhagavan's physical form appeared before him. Suddhanananda prostrated before Bhagavan and later before Ganapati Muni who was close by. Bhagavan said to Ganapati "Is it Suddhananda the author of Bharata Sakti ?" Suddhananda was overjoyed at that compliment. Bhagavan asked him to stay back for food to which Bharati replied "Yes Sir, But I have come for spiritual food." Suddhananda did not indulge in asking several questions, his happiness lay in savouring the mere darshan of Bhagavan. At that very moment several Tamil verses, welled up in him. Sri Aurobindo Ashram at Pondicherry. Bharati's devotion for Bhagavan formed itself into a mellifluous poetic composition Sri Ramana Vijayam. It is now necessary to refer to some who had contributed to the development of the Ashram and who could explain Bhagavan's teachings. He came to the Ashram in 1923 when he was barely nineteen without informing anyone at home. His father, who did not like the son going away from home, somehow guessed that he must have reached Arunachala and landed at the Ashram in search of his son. The father knew the Maharshi as Venkataraman several years earlier . But on seeing the Maharshi in the new place he was astonished and said " This is not the Venkataraman I used to know." To this Bhagavan replied smiling "Oh he! It is quite sometime since he vanished." And speaking of Viswanatha, Bhagavan said, "By the time he left his home he had acquired some knowledge of Sanskrit at least, I did not have even that when I left home." Viswanatha Brahmachari had a great devotion for Ganapati Muni, associated himself with him and studied all his works. He was a government official holding a high position. Venkataramaiah opened his eyes and looked around, he saw a huge snake go out of the window past the children. He was astonished at this. Venkataramaiah's daughter, Kamakshi was an Ashram child. Her husband Ramachandra Kaundinya also was a great devotee of Bhagavan. Venkataramaiah helped Bhagavan's devotees a lot. He acted as an interpreter for them in their interaction with Bhagavan and compiled those conversations in three volumes entitled Talks with Maharshi. He also translated into English, Tripura Rahasyam. A native of Tiruvannamalai he joined Bhagavan's circle of devotees at the age of ten. He had also associated himself with Ganapati Muni and learned from him Mantra Sastra. Well-versed in English, Sanskrit and Tamil he frequently wrote and published articles on Bhagavan and was helpful in the Ashram activities. When Bhagavan's collected works were to be published as Nool Tirattu (Tamil) Bhagavan chose Sundaresa Iyer to write the introduction. This itself indicated his worth. A reputed scholar and Tamil poet. As he had a a great attachment for Tamil he changed his name from Subrahmanian to Muruganar . His magnum opus Ramana Sannidhi Murai has attained the status of a classic and is venerated by Tamil poets. He initially looked upon Bhagavan as an embodiment of all gods but later he became a votary of the concept of a formless god. He was a firm Advaitin. It was he who was responsible for Bhagavan's Tamil works Upadesa Undiyar and Ulladu Narpadu. He joined the Ashram soon after leaving college . He was a personification of service and was an embodiment of devotion towards Bhagavan. He had a good knowledge of Tamil and was fond of singing Tamil songs in praise of Bhagavan. The Ashram would always reverberate with his songs. He functioned as a Public Prosecutor at Chittoor and came to the Ashram. His diary, Day by Day with Bhagavan was published by the Ashram. Among the Telugu writers mention has to made of Griddalur Narasimha Rao who rendered Arunachala Stuti Panchakam and Ulladu Narpadu into Telugu. For this purpose he learnt Tamil and Bhagavan had gone through all his works. He also learnt Tamil. His service consisted in his translating Ramana Gita both into Telugu and English. It was at his request that Bhagavan selected a few slokas from the Bhagavad Gita and composed Sri Bhagavad Gita Ratnamalika (also known as Sri Bhagavad Gita Saram). She could be described as Ramana Putri. She was widowed very young and came to Bhagavan's presence in 1941. From 1945 to 1950 she recorded in the form of letters the conversations and events which took place in Bhagavan's presence. To facilitate this work she spent most of her time at the Ashram. These were collectively published as Sri Ramana Ashrama Lekhalu in Telugu. Bhagavan was very affectionate towards her.